Welcome to my blog. I use this blog to share with you my thoughts and the things that happen in my life. I come here each day and post tidbits about my life, my companies, my past, my present and my future. Apparently the 19 ladies competing for the love of Ray J aren’t the only ones who are fond of the singer/rapper. Fifty-one of Tinseltown’s finest were in attendance of the private premiere party for the season two launch of For the Love of Ray J, including Ami Shafrir and Jackie Long. As friends of Ray J, it was only logical that the two were invited. 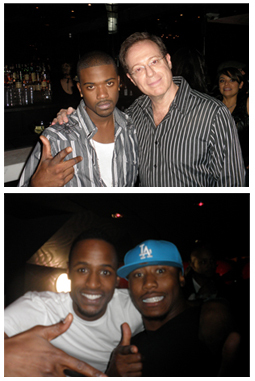 With Ami’s innate ability to foresee the next trend in Hollywood and Jackie Long’s effort to single-handedly turn Hollywood “Green,” Ray J included them as part of the 51 celebs who’s minds he values most in viewing the second season of his show. Of course after handling his business, the R&B superstar got down to enjoying the rest of the night. Post premiere, “Go-Green” celeb Jackie Long, grabbed Ray J and Ami Shafrir and showed them how to party “green style” at Eco Club. The guys partied into the wee hours of the morning, along with Hassan Johnson from The Wire, Seattle based artist Livio, and the Denver Broncos’ Brandon Marshall. If you’d like more information about this topic, pictures, or to schedule an interview with Ami Shafrir or Jackie Long, please contact. Businessman claimed for years that he was the victim of a scam — and of wiretaps by a famed private eye. LAS VEGAS – Until last week, Ami Shafrir had spent four frustrating years telling anyone who would listen a seemingly incredible tale of being conned out of tens of millions of dollars worth of businesses, property and cash, and of being wiretapped in the process by private detective Anthony Pellicano. Shafrir, an Israeli-born telecommunications whiz who came to the United States 15 years ago “looking for my destiny” and wound up rich in Beverly Hills, told his story in impassioned speeches during court proceedings and on a website he called BigCrime.com. Shafrir’s story was that while he was going through a divorce, two brothers – fellow Israelis – had befriended his wife, Sarit, and offered to help her through the contentious split-up; that the brothers turned out to be Daniel and Abner Nicherie, both of whom had criminal records; and that by the time he and his now ex-wife found out who they were, it was too late. In lawsuits filed first in Los Angeles Superior Court, then federal court, Shafrir alleged that the Nicherie brothers had used forgery and other schemes to loot his family’s assets, including office buildings on Sunset and Wilshire boulevards and a company that connected callers to Internet chat rooms. The brothers also tried to frame him for credit card fraud and for molesting his own child, Shafrir alleged, and paid $154,000 to Pellicano, Shafrir said, to tap his phone and learn how he was trying to protect himself against them. But the worst part, Shafrir said, was how the older of the brothers, Daniel Nicherie, spent millions of dollars of the looted money to hire teams of lawyers to file lawsuit after lawsuit against him, so many that he was forced into bankruptcy while he went from court to court, praying that some judge would believe the wild conspiracy theory he spouted. “I keep on waking every morning to a new day of nothingness, continuing to battle the terror,” he lamented last November, in a letter to the U.S. Labor Department. Shafrir often feared that no one believed him. In fact, three federal agencies, the FBI, IRS and Labor Department, had opened investigations. And on Thursday, when Shafrir flew here from Los Angeles for a meeting with the elder Nicherie brother, federal agents moved in to arrest Daniel Nicherie on seven counts of wire fraud, bankruptcy fraud and pension fraud. On Friday, a 49-page arrest warrant affidavit was unsealed describing Daniel Nicherie, 44, as a man with 11 aliases and a trail of victims stretching across the country and spanning more than a decade. He faces a hearing today in Los Angeles on whether he should remain in custody in the criminal case that could shed light both on high-stake confidence games and the private detective work of Pellicano, who is currently in prison on explosives charges. In addition to the Shafrirs, Nicherie allegedly duped a Los Angeles physician and his father out of $275,000 by telling them they would be joining other wealthy investors, including a prominent Israeli entertainer, in a venture selling “close out” merchandise over the Internet. In fact, the celebrity was not an investor and the money was used for Nicherie’s entertainment and “personal expenses,” such as airfare and meals, the government said. As for Ami Shafrir, the government affidavit estimates that he and his ex-wife had, indeed, been “defrauded out of at least $40 million.” Daniel Nicherie used his take, the document says, on everything from his father’s memorial service to a residence in San Diego to the hiring of Pellicano. The government also echoes Shafrir’s years of complaints that a cadre of civil lawyers had exploited the court system “to help promote” the fraudulent schemes. Shafrir got his start in electronics, owning a sales and repair business in Israel. He met Sarit when she came in as a customer. They married in 1988 and the next year moved to the United States, convinced it was the only place for a man of Ami’s ideas and drive. The Shafrirs created several companies to service the trades that had figured out how to profit off the Internet, from psychic hotlines to racy chat rooms. One firm provided the phone lines and another billing services for vendors. Within a few years, they were living with their two children in the Mount Olympus enclave, above the Sunset Strip, and were able to buy the small office building in which they rented space and a 50,000-square-foot building on Wilshire owned by producer Dino De Laurentis. Their businesses were more successful than their marriage, however, especially after Ami began spending time in Europe, expanding their holdings. Suspicious of his conduct on the road and feeling neglected at home, Sarit filed for divorce in August 1998. They still were negotiating the terms of their split the next year when she met the Nicheries. In a court declaration, Sarit Shafrir said the brothers gave their names as “Nishrie,” which is why she did not immediately find their criminal backgrounds: Daniel Nicherie had received a one-year sentence in a Texas case for defrauding the University Savings Assn. of $1.2 million in loans. His brother, Abner, had pleaded guilty in 1999 to one federal conspiracy count in a scheme to defraud pharmaceutical manufacturers. Sarit said the brothers presented themselves as “wealthy businessmen able to provide legal and consulting services,” and offered to help make sure her husband did not cheat her in their divorce. One way they alienated her from him, she said, was by hiring Pellicano, three years before the private investigator’s purported wiretapping would make front-page headlines. Sarit last year was one of the witnesses called before a federal grand jury investigating the detective and lawyers who may have benefited from such eavesdropping on Hollywood celebrities and other Southern Californians. Associates have said that Pellicano was cautious and secretive and never let clients listen to his recordings. But court records suggest that he may have departed from his rule in this case. Because Ami Shafrir often spoke in Hebrew, his ex-wife said, the detective let the Nicheries, who also spoke the language, come to his office to hear the tapes. They, in turn, sometimes called her on a cellphone and let her listen to excerpts, she said. Sarit later alleged in court papers that the brothers had instructed her to transfer her home to a Nevada corporation and her savings to accounts they specified to keep such assets out of reach of her husband. She eventually helped her ex-husband in his own racketeering suit against the Nicheries. The suit alleged that the brothers had driven him into bankruptcy, tried to send him to prison by getting a man to claim that Ami had helped him in a credit card fraud, and had even encouraged his daughter to say he had molested her. Last year, Shafrir’s suit was settled, on paper at least, when the Nicheries agreed to pay him $4 million, though Shafrir acknowledged that, like others who had sued them before, he might have a hard time collecting. The major fraud section of the U.S. attorney’s office in Los Angeles said the arrest will not end an “ongoing” investigation. Assistant U.S. Atty. Steven Olson said the findings of the three agencies will be presented to a federal grand jury and that additional charges – and defendants – could be included in an indictment. Olson described Daniel Nicherie as “an economic predator” and said he had been arrested now in part because he was in the country. Although Nicherie lists his residence as Las Vegas, he also has a home in Belgium. In Las Vegas on Friday, one of Nicherie’s criminal lawyers, David Chesnoff, asked a federal magistrate to let the defendant stay free and be with his five children, one of whom suffers from Crohn’s disease. But after hours of legal wrangling, and more on Monday, Nicherie remained in custody pending today’s hearing. Ami Shafrir, meanwhile, said he planned to see them all in court today. “I wouldn’t miss it,” he said. A former Los Angeles resident who posed as an attorney and investment banker, gained the trust of small business owners and investors, and then looted their companies and misappropriated their investments was arrested yesterday afternoon in Las Vegas, United States Attorney Debra W. Yang announced today. Daniel Nicherie, 44, of Brussels, Belgium, was arrested pursuant to a criminal complaint by special agents with the Federal Bureau of Investigation and IRS-Criminal Investigation. The complaint, which was filed on Wednesday and unsealed today, charges Nicherie with four counts of wire fraud, two counts of bankruptcy fraud and one count of pension fraud. Nicherie allegedly defrauded a Los Angeles couple out of approximately $40 million in cash, real property and businesses. Nicherie told the victims, Ami and Sarit Shafrir, that he could assist them with their business interests. Nicherie then took control of the Shafrirs’ companies, drained the companies’ assets and then put the companies into bankruptcy. Nicherie is also accused of seizing Sarit Shafrir’s personal assets through a similarly elaborate scheme. Nicherie then took a series of steps, including the filing of more than 100 lawsuits, to prevent the Shafrirs from recovering their assets. Nicherie is also charged with defrauding Ezra and Gil Mileikowsky of Los Angeles out of $275,000 in cash. Nicherie made a series of misrepresentations that caused the Mileikowskys to invest in a purported business which allegedly sold excess inventory over the Internet, as well as a purported venture capital fund. Nicherie lured the Mileikowskys by falsely stating that they could expect a high rate of return on their investments and that prominent individuals, including Haim Saban, a television and film producer, and Shuki Levy, an Israeli entertainment figure, had invested with Nicherie. A criminal complaint contains allegations that a defendant has committed a crime. Every defendant is presumed innocent until and unless proven guilty beyond a reasonable doubt. If convicted of the charges set forth in the complaint, Nicherie faces a maximum penalty of 35 years in federal prison. Nicherie is expected to make his initial court appearance at 3:00 this afternoon in United States District Court in Las Vegas. This case was investigated by the Department of Labor, IRS-Criminal Investigation and the Federal Bureau of Investigation.